Clicker Heroes 2 marks the point that clicker games – y’know, the ones all about making numbers go ever-higher with a minimum of interaction – encroach so far into action-RPG territory that I’m not sure I’ll ever be able to play a Diablolike again. The illusion is shattered; the pretence that I play hacker-slashers for any reason beyond numerical embiggening ripped away. Clicker Heroes 2 is master of dopamine, overlord of loot-hunger, god-emperor of unputdownable nothingness. Until, unexpectedly soon, it isn’t. Out now on Steam early access, Clicker Heroes is a game about earning gold set within the structure of a game about stabbing monsters. Your character moves endlessly forwards along an infinite path, the fantastical beasts they face steadily growing more and more hitpoints. To counter that, you spend the gold you earn from kills on upgrades to your gear. Thus, the core loop of the game is trying to achieve parity of hero damage and enemy health. Any moment of power, where suddenly you’re shovelling your way through enemies with wild abandon, is just that – a moment. Then you’re back on the back foot, striving to get enough gold to unlock the next meaningful upgrade. Again, again, again. You can leave this to happen by itself if you like, but any upgrades will take an age. Your hero will automatically stabs at anything in their path, but you can expedite the process by frantically clicking, just as you would in a Diablo game. On top of that, you get a hotbar that, as you very slowly level up, gradually fills with special powers, almost all of which ultimately entail making your clicks dole out more damage. So far, so Clicker Heroes, but two things in the sequel make this feel so much closer to an actual aRPG. For one thing, your character visibly moves forwards and attacks enemies all the time, as opposed to most of your screen simply being filled by a mostly static monster that switches out for the next one once dead. The sensation of progress is obviously artificial – Sisyphus never stops – but plays into the essential subterfuge of clicker games, which is to make you believe that denouement is forever around the next corner. The other thing is that you get a vast skill tree, initially on a fixed path, but it soon opens up to let you dictate your own character build. It never falls far from the auto-attack’n’occasional click-frenzy tree, but there’s just enough flex that you feel you’re in control, not merely a helpless leaf on the one-way breeze. Critical to a clicker game keeping its spider-legs clasped firmly to our brains is the idea that some big, paradigm shift lies just beyond the horizon. In AdVenture Capitalist, my recurring nemesis, there are new ‘planets’ to unlock – the same game but with changed art and names – and here it’s far-off branches of the skill tree, alluringly promising massive bonuses to damage dealt, plus increasing automation of the hotbar skills. It got me. Of course it did. However, I got out not long after – and weeks sooner than I ever did with AdVenture Capitalist or Realm Grinder, my other great clicker folly. The reason for that is that Clicker Heroes 2 too obviously wears its inherent futility on its sleeve. That illusion of progress, your character animatedly warring their way along an infinite road’o’monsters, initially works as a spur – what’s that coming over the hill, is it a new monster? No, it’s just another one of the same few enemy types, in the same few environments. There’s no Valhalla to be found. Just the road, the road to nowhere. 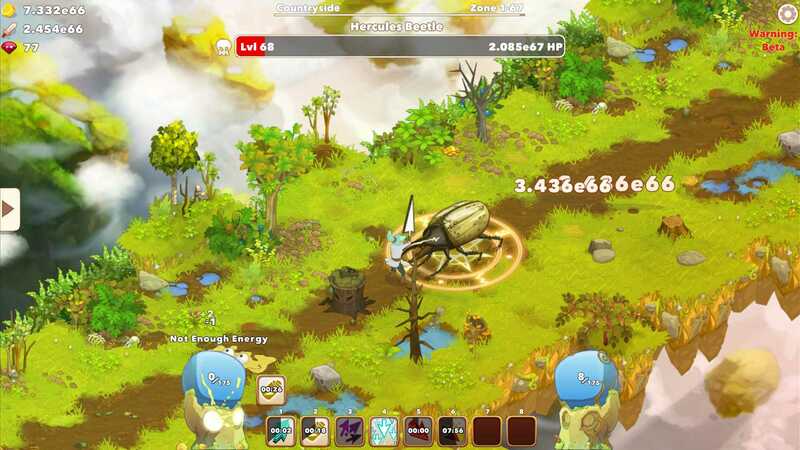 Whenever Clicker Heroes 2 was on my screen, I kept on clicking. Whenever it was not, it fell right out of my mind – the familiar hunger to see how things had changed after just a few moments offline simply wasn’t there. Maybe I’m, thank the gods, simply burned out on these things – or maybe Clicker Heroes 2 has made a critical error in moving away from static presentation. The visual certainty that this road goes to nowhere counteracts the toxin of compulsion. Counter-intuitively, it is in trying to escape the bounds of clicker convention that Clicker Heroes 2 inadvertently reveals Oz behind his curtain. And, I turn, I see him lurking behind Diablo et al too, promising heart and courage and brain when all he really has is ephemeral numbers. There’s another way CH2 subverts clicker/idle game tradition, and it’s equally commendable in intention. It boasts a fixed, relatively high price-tag but no microtransactions. Usually these things are free-to-play, then promptly slice hooks so deeply into a victim’s skin that their body screams for the vanishingly brief relief of paid speed boosts or multipliers. The stated reason for the change is that the developers felt uncomfortable about the ‘whales’ who spent thousands of dollars on these boosts, which is entirely noble if true. And, truth be told, the (for now) certain knowledge that the game isn’t an elaborate exercise in fleecing me out of additional groats makes the entire affair feel significantly less unsavoury. But maybe, too, the knowledge that there is no way to shortcut, no temptation of microtransactional Satan to get behind me, is part of the reason why Clicker Heroes 2’s hooks fell from my flesh so quickly? I could see everything it was, everything it would be – between the endless road and the certainty that there could be no corner-cutting, the futility hit me like a sledgehammer a few hours in. Which, honestly, only makes me sad. 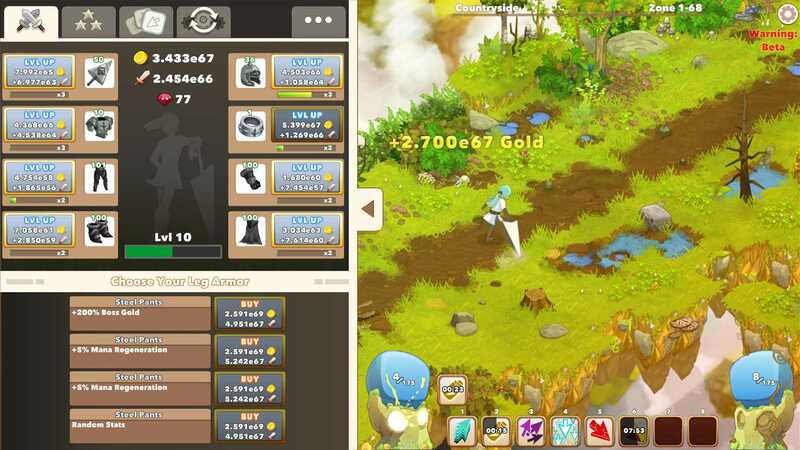 Clicker Heroes 2, for all the inherent cynicism of the clicker genre, really is trying hard to be something more – to leave these games’ worst sins and cynicism behind. I admire its drive to be better. I’m relieved that this noble intent means I didn’t get hooked for long. Copyright © 2014 - 2019 SocksCap64, All Rights Reserved. Logos, Trademarks, Pictures Belongs To Their Respected Owners. Powered By WordPress. 70 Queries in 0.418 seconds.